Honey bees play a vital role in Earth’s food chain. They pollinate (transfer pollen from the male part of a plant to the female part of the plant, allowing fertilization to take place) most flowering plants, including many of the top human food crops, such as blueberries and cherries. In fact, honey bees are so important that farmers often have bee hives brought to their farms to ensure their crops are pollinated. The bee hive is made up of a well-organized caste system, with the queen bee playing the most important role. The queen bee is the largest and longest-living type of bee – she can survive for up to six years. The queen bee, as the only sexually developed female in the colony, lays eggs all day long to spawn the next generation of bees. She also produces chemicals to influence the behavior of the other types of bees. Worker bees, who are all female, forage for food (pollen and nectar from flowers), build and protect the hive and keep air within the hive clean by beating their wings. Worker bees are sexually undeveloped and don't lay eggs under normal hive conditions. If you see a bee outside the hive, it will be a worker bee, as the other types of bees never leave the hive. Male bees, called drone bees, are larger than the worker bees but smaller than the queen bee. Compared to the queen bee and worker bees, the drone bee has an easy life. Its only tasks are to eat and mate with the queen. Several hundred drone bees live in the hive during spring and summer, but as soon as they mate with the queen they die and before winter comes they are ejected by the worker bees. 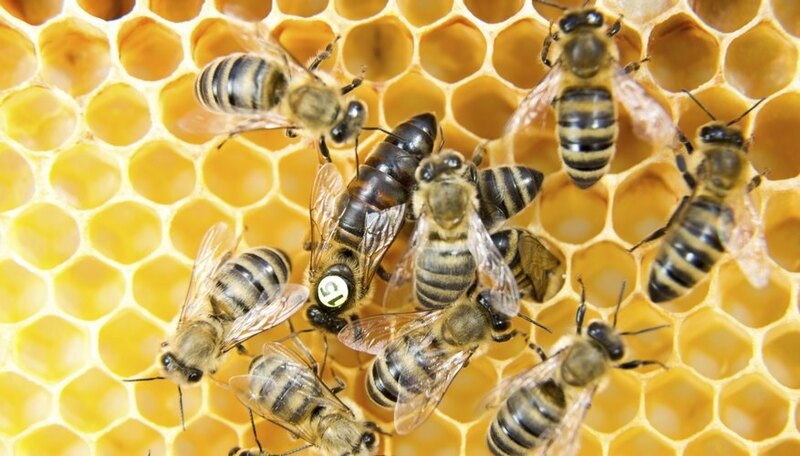 A bee becomes a queen bee thanks to the efforts of the existing worker bees in the hive. A young larva (newly hatched baby insect) is fed special food called "royal jelly" by the worker bees. Royal jelly is richer than the food given to worker larvae, and is necessary for the larva to develop into a fertile queen bee. The larva is enclosed with a cell inside the hive, where it makes pupae and develops into a queen. Although a queen bee stays fertile for her entire life, her productivity often declines in old age. Sometimes, the queen bee goes missing from the hive. Under these circumstances, or when the queen bee dies, the worker bees need to find a new queen. If the old queen bee is still alive, the worker bees may kill her, or they may let her live alongside the new queen bee until she dies naturally. Maine.gov: The Buzz About Bees! Gillespie, Claire. "How Does a Bee Become a Queen Bee?" Sciencing, https://sciencing.com/bee-become-queen-bee-5200755.html. 20 August 2018.